Carollers in heritage costumes will sing again this year as part of the three-part holiday series starting Dec. 1. Traditionally, the holiday season is a time for friends, family and loved ones to gather. This year, the Steveston Historical Society and the Richmond Arts Coalition are teaming up with the City of Richmond to offer a special way to engage in the festive cheer. 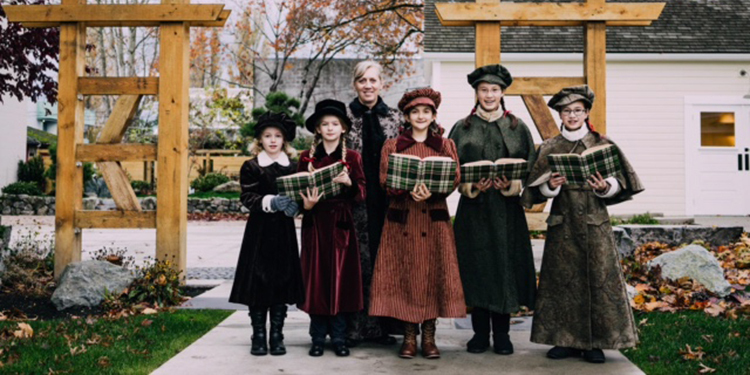 Songs in the Snow is s three-part series inviting visitors to the Steveston Museum for Christmas-themed arts over three consecutive Saturdays starting Dec. 1 at 4 pm in Town Square Park. While local community groups come together to perform favourite holiday music, there will also be an opportunity to explore displays, create vintage crafts and partake in a memorable selfie in the illuminated park. After the enthusiastic reception to Songs in the Snow last year, Linda Barnes says the Steveston Historical Society is excited to again work with community partners on this special initiative. "The Richmond Arts Coalition brings musicians and performers, the Girl Guides carol in period costume, GF Financial Group sponsors the hot chocolate and more—it's a real community event," says Barnes, who chairs the Steveston Historical Society. And everyone attending will also have a chance to give to those less fortunate. A different local charity will be the beneficiary each evening. On Dec. 8 and 15, local artisans will also have their designs for sale to help visitors pick out a perfect present.